For over 35 years Byer has crafted his songs of love, wonder, pain and hope with power and eloquence. He can comment on the spiritual search or poke fun at fast food and political injustice with equal charm. Always grounded in compassion for the human condition, at his best, Byer reflects back to us our own struggles to envision the world as it could be. At the core of his work is a profound reverence for life and the gifts of this world. He explores the possibility of seeing the world as it is and not losing heart. 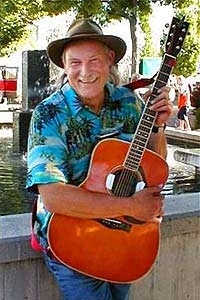 Allan has been playing in Bend, Oregon and surround areas for over 25 years.